A few rare gem materials are pieces of extraterrestrial objects or are a product of their impacts. Moldavite: Moldavite (also called vltavin or Bouteille Stone) is an amorphous glassy material, a mineraloid, that is usually olive green in color. It is thought to have formed during an asteroid impact about 15 million years ago in central Europe. This specimen, which was sold online as "moldavite," turned out to be an imitation material. Can Gemstones Really Come from Space? Rocks that fall from the sky have frightened and fascinated people throughout history. They immediately generate curiosity and have a scientific significance. They are made of extremely rare materials that interest scientists, collectors, and curious people alike. Many meteorites and impactites are small enough and attractive enough to be used as gems in the same condition in which they fell from the sky. Iron meteorites are alloys of iron and nickel that can be cut and polished into beautiful gems or fashioned into the metal parts of jewelry. Pallasites are stony-iron meteorites that contain colorful peridot (olivine) crystals that can be cut into gems. Impactites are often colorful glasses that can be faceted, cut into cabochons, or carved into small sculptures. The stresses placed on a meteorite during its formation, its travel through space, entry into Earth's atmosphere, and impact with Earth's surface all have a chance of fracturing the olivine crystals. Because of these fractures, it can be difficult to find pieces of extraterrestrial olivine that are large enough to facet - but many faceted stones have been produced! Photograph by Doug Bowman, used here under a Creative Commons license. Even though these materials are extremely rare, they can typically be purchased at a lower price than some of the most popular gemstones. Why are they so inexpensive? Most people are not familiar with them, so they are not being requested in jewelry stores. In addition, the supply of these materials is so small, so fragmented, and so unreliable that they do not have a place with wholesale or mass-market jewelers. The highest quality "as found" specimens are of greatest interest to scientists, meteorite collectors, and mineral collectors. The best gem-quality materials generally go to a small number of designer jewelers who use them to create one-of-a-kind pieces. Smaller and lower quality items fall into the novelty gem and collectibles markets. On this page you will find photos, art, and summary descriptions for several extraterrestrial materials that have been used as gems. Most people are surprised by their diversity and beauty. 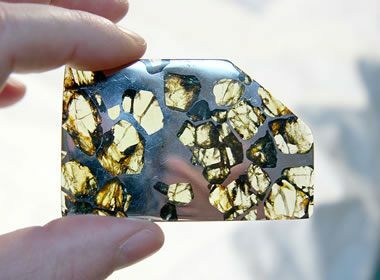 Pallasite peridot: This is one of the most incredible gemstones. 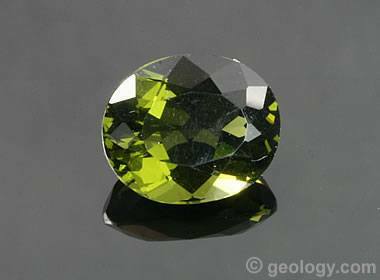 It is a faceted piece of gem-quality olivine, known as peridot in the gem trade, that was removed from a pallasite meteorite. Extraterrestrial peridot is certainly one of the rarest gem materials on Earth. This stone is 2.85 millimeters in diameter and weighs about ten points. Photo by TheGemTrader.com. People have been fascinated with extraterrestrial gems for over 100 years. They are rare materials with a novelty origin, and many people want them. Moldavite was being made into novelty gems as early as the late 1800s, and they were popular throughout Europe and popular with tourists. The demand for moldavite jewelry exceeded the amount of natural material available. So, enterprising people started faceting bottle glass, and those with glassmaking abilities began producing glass in just the right colors to supply this market. Today, much of the moldavite being sold as faceted gems has been manufactured, as well as some of the rough specimens. If you want to read detailed information about fake moldavite, there is a good article titled "Moldavites: Natural or Fake?" in the Spring 2015 issue of Gems and Gemology. Tektites and desert glass are just as easy to fake, so many of the specimens of these materials being offered for sale are undisclosed imitations. Medical professionals find it troubling that many people purchase materials like moldavite and use them for healing and wellness aides when there is no scientific evidence that they are effective. When that is combined with the fact that many of the moldavite items being sold today are undisclosed fakes, the use of these materials for anything other than novelty jewelry is concerning. 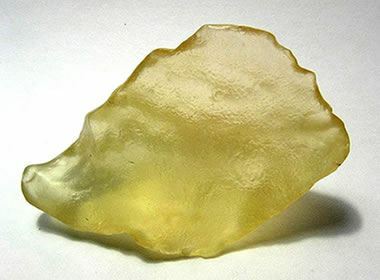 Libyan Desert Glass: Libyan Desert Glass is a material that is thought to have formed during a meteorite impact in the Libyan desert about 26 million years ago, near what is now the border between Egypt and Libya. One theory has the meteorite exploding in an air burst that flash-melted sand and other material on Earth's surface below. Many pieces of glass have shallow surface indentations, similar to the regmaglypts of meteorites, that suggest ablation as the glass moved rapidly through Earth's atmosphere. Like moldavite, desert glass is considered to be an impactite. Rare pieces of gem-quality glass are sometimes cut into faceted stones or cabochons. Uncut pieces with an attractive shape and color are often wire-wrapped or drilled for use in making jewelry. Representative specimens are also sought by meteorite and mineral collectors. Like moldavite, desert glass is a soft and brittle material that is best used in earrings, pendants, and other jewelry that will not be subjected to abrasion. Photograph by H. Raab, used here under a GNU Free Documentation License. King Tutankhamun's Desert Glass: Over 3300 years ago, the ancient Egyptians knew about Libyan Desert Glass and held it in high regard. 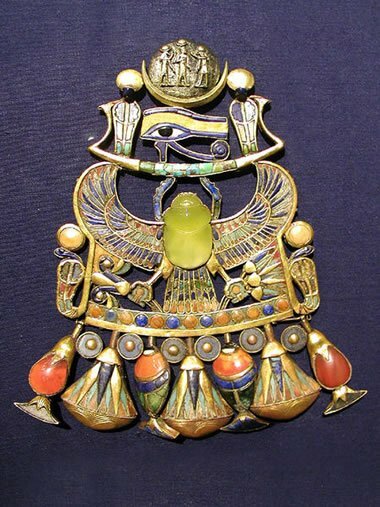 The pendant shown above was one of several buried with King Tutankhamun (King Tut), an Egyptian pharaoh of the 18th Dynasty who ruled between 1332 and 1323 BC. The yellow center stone is a superb piece of Libyan Desert Glass, used as the dominant gem in this pendant. Photograph by Jon Bodsworth, found at the Wikimedia Commons. Meteorites: Some people use small, nicely shaped meteorites to make pendants and earrings. They might wire-wrap the meteorites, drill them, attach an eyelet, or pass a cord through a natural hole in the stone. Whole small meteorites like these Campo del Cielo specimens make interesting pendants that surprise people when they learn of their extraterrestrial origin. Polished meteorite: Cutting and polishing an iron meteorite usually reveals a fantastic pattern of metal crystals inside. Known as a "Widmanstatten pattern," these crystal shapes are natural art that many people appreciate. 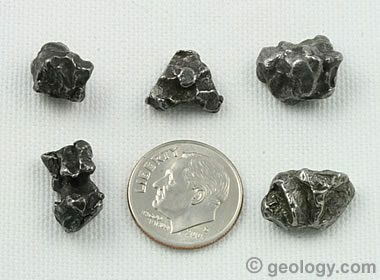 Cut and polished meteorites are used to make cabochons, pendants, beads, watch faces, rings, and many other items. 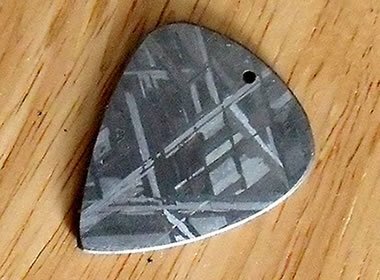 The piece in the photo above is a guitar pick. Imagine making music with a piece of the core of an extraterrestrial body! Photo by Mike Beauregard. Image used here under a Creative Commons license. 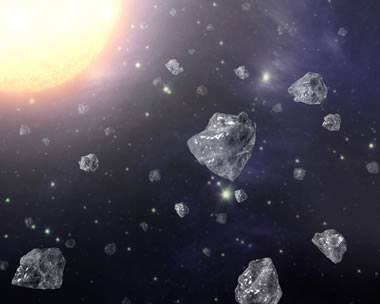 Diamonds from Space: In the 1980s, researchers discovered that some meteorites are loaded with tiny nanometer-sized diamonds. In fact, about three percent of all carbon found in meteorites is in the form of nanodiamonds. Image by NASA. Learn more about diamonds in meteorites. 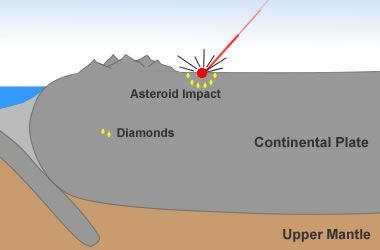 Asteroid Impact Diamonds: Large asteroids can hit the earth at a velocity of 15 to 20 miles per second. This produces an impact that is powerful enough to vaporize rock, excavate a huge crater, and blast millions of tons of ejecta into the air. The force at the point of impact exceeds the temperature and pressure required to form diamonds. For diamonds to form, the target rock must contain significant amounts of carbon. The Popigai Crater in northern Russia is an asteroid impact that may have produced the world's largest diamond deposit. Tektite: An excellent example of an Indochinite tektite from Southeast Asia. Tektites are fragments of ejecta produced when a large extraterrestrial object strikes the Earth. The heat of the impact flash melts rock in the impact area and ejects it in the molten state. These molten masses solidify into a natural glass, a mineraloid, in flight and fall to Earth in the area around the impact. The impact that produced the tektites of the Indochina strewn field occurred about 800,000 years ago. This 48.7-gram specimen is 48 mm x 35 mm x 21 mm in size. The shiny, glassy surface is natural, and similar in appearance to obsidian, which is a terrestrial igneous rock. Note the small crater-like features on the surface of this specimen, which are reminiscent of regmaglypts found on meteorites. Photograph by Leigh Anne DelRay, copyright Aerolite Meteorites. 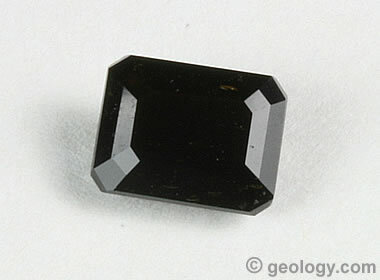 Faceted tektite: Some people use fragments of tektites to produce faceted stones. They are usually opaque to slightly translucent and have a pitch black color. They have an elegant appearance similar to jet and are enjoyed by many people. Because of their glassy composition, they have a hardness that is less than optimal for use in a ring. However, in pendants, earrings, and pins, they are less likely to suffer from abrasion or impact. This specimen is a 9 x 7 millimeter rectangular stone weighing about 2 carats that was found in Laos. 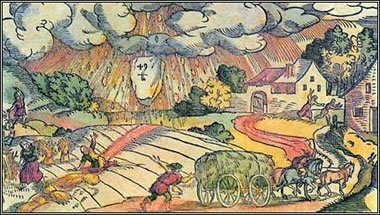 The Fall at Thuringia in 1581: An artist's depiction of a meteorite fall that occurred near Thuringia, Germany, during the afternoon of July 26, 1581. A loud explosion that seemed to shake the Earth and a bright flash were observed throughout the area. Then a 39-pound rock fell from the sky, burying itself into the soil to a depth of three feet. Public domain image by an unknown artist. Tektite pendant: This pendant is a wire cage that encloses a tektite from the Indochina strewn field. 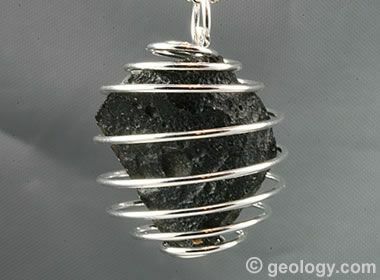 Wire wrapping is a popular way to display tektites, meteorites, desert glass, and moldavites. This specimen is about 30 millimeters in height and makes a nice pendant. Smaller specimens are wrapped with finer gauge wire and used as earrings. Tektites are novelty gems that attract attention, and if the wearer knows the story behind them, it often leads to an interesting conversation.